The piece focuses on worsening urban heat trends and the need for climate governance to address its disproportionate impacts, both geographically and in terms of marginalized groups. 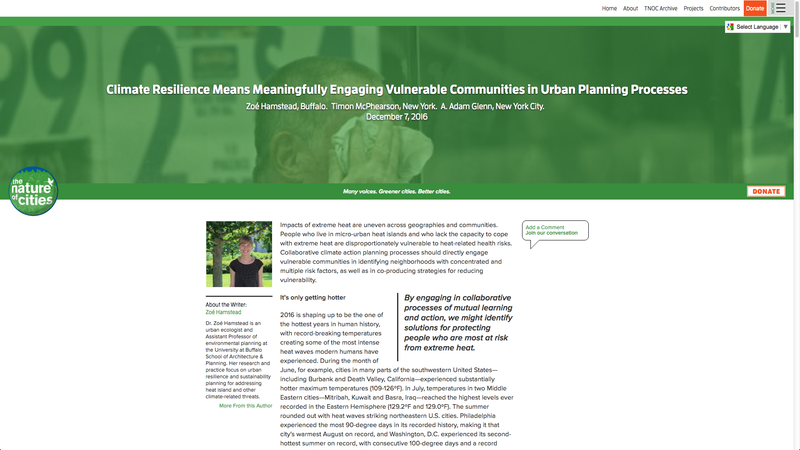 The Harlem Heat Project was held up by the authors as an example of how participatory community engagement techniques can be used to work with local residents to collect data and share personal experiences, while gaining mass media exposure and collaborating with various stakeholders to search out solutions to an important public health risk. Posted in About AdaptNY, Harlem Heat, Neighborhoods Project and tagged with Adaptation, AdaptNY, disaster preparedness, Harlem, health, heat, heatwaves, resilience. RSS 2.0 feed.